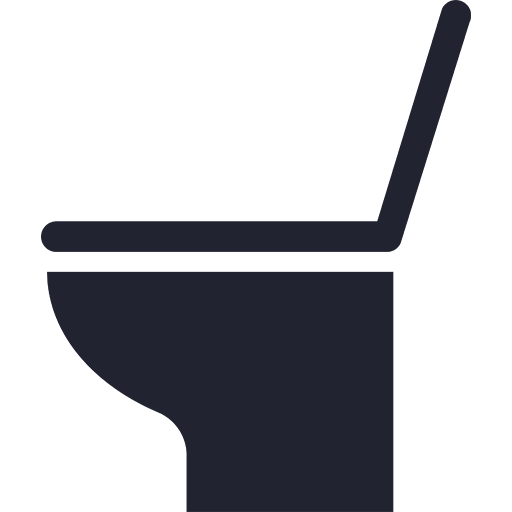 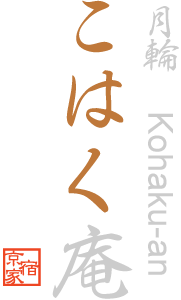 The name 'Kohaku' refers to amber, while 'an' refers to a cozy retreat. 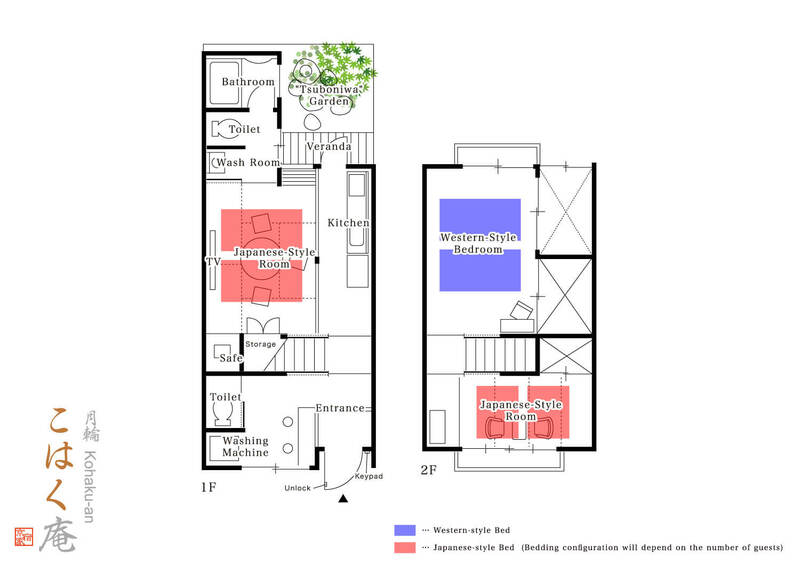 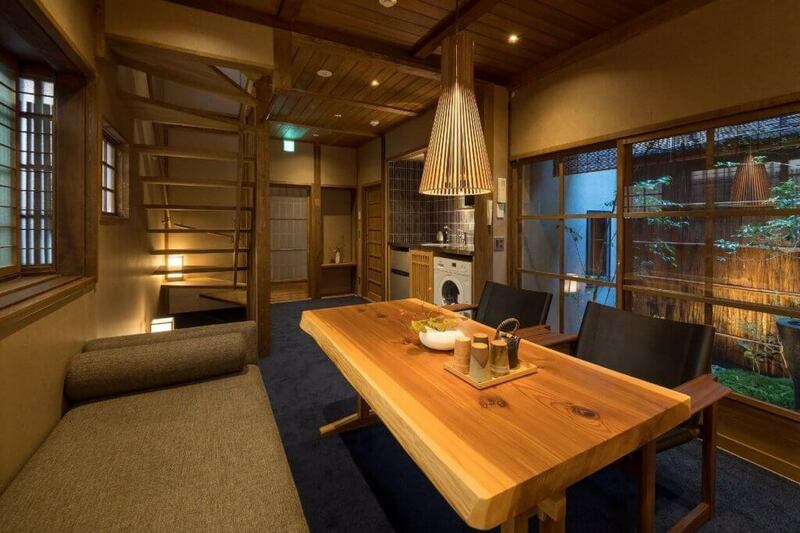 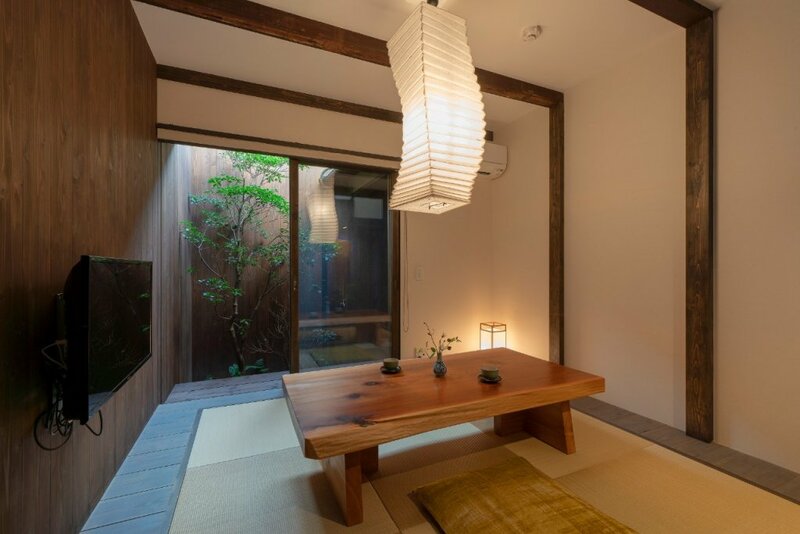 This machiya house has been designed to provide a space suitable for both large groups of family and friends, to smaller groups & couples looking for a spacious hideaway. 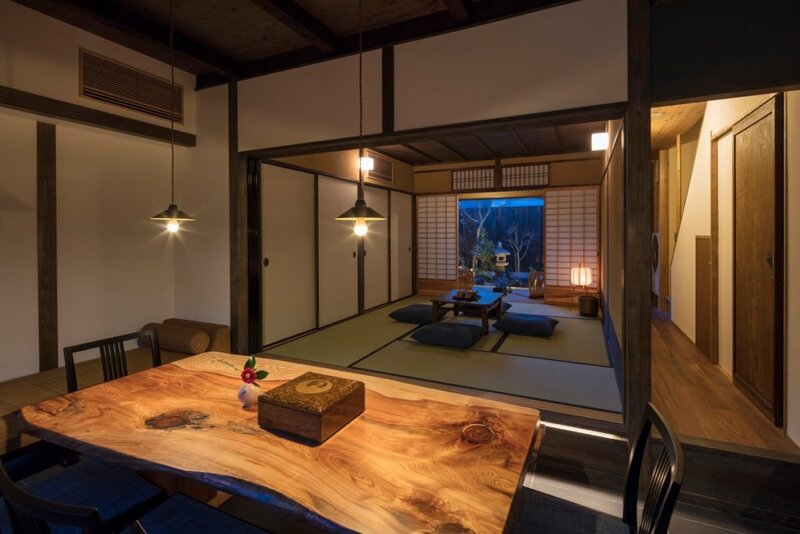 The rich, golden hue of amber is reflected throughout the house – creating a warm & inviting atmosphere that is perfect to retreat to after a day of exploring Kyoto. 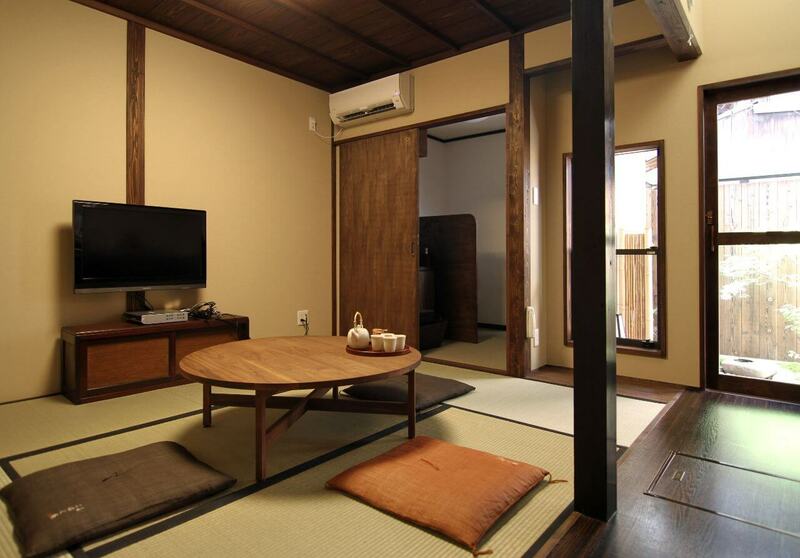 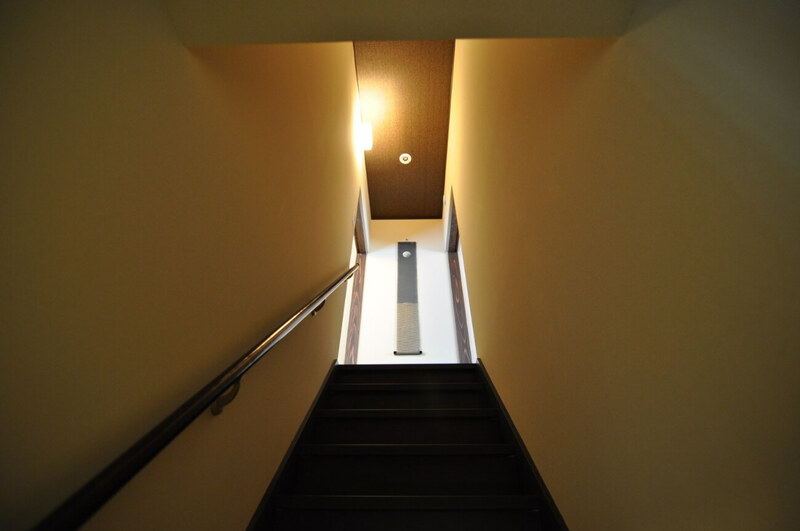 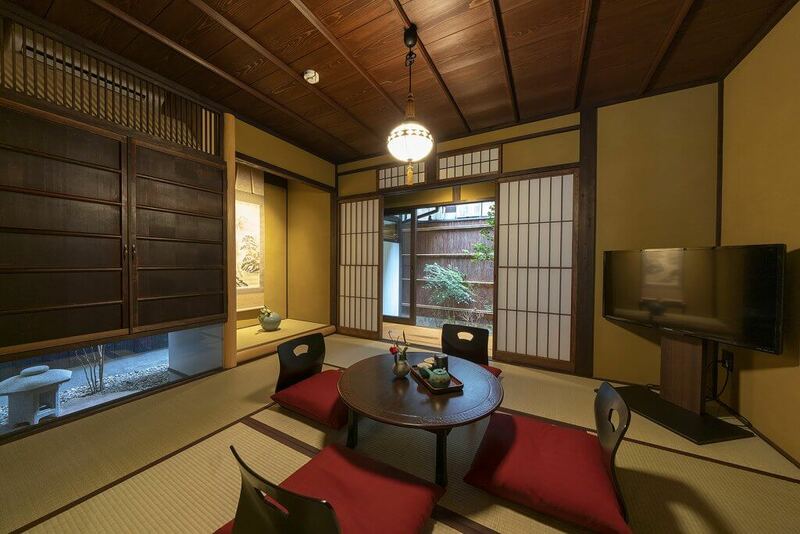 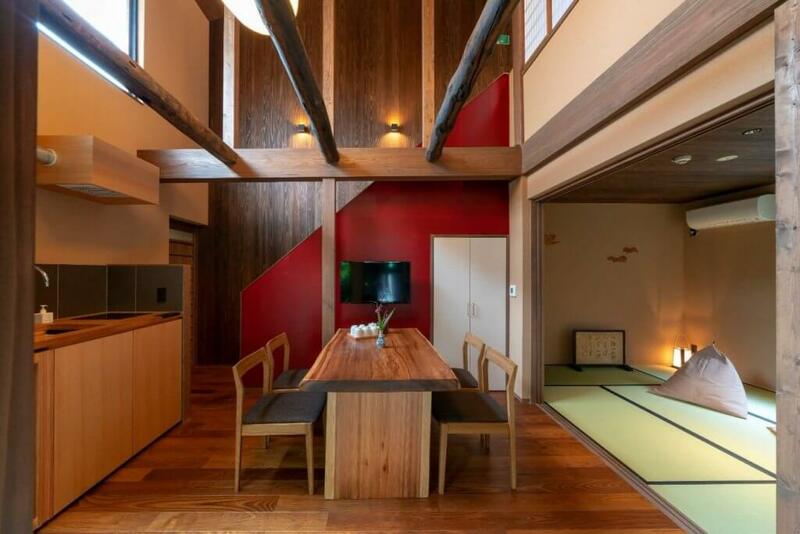 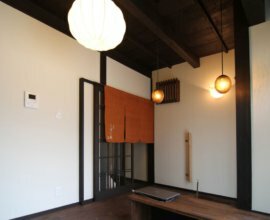 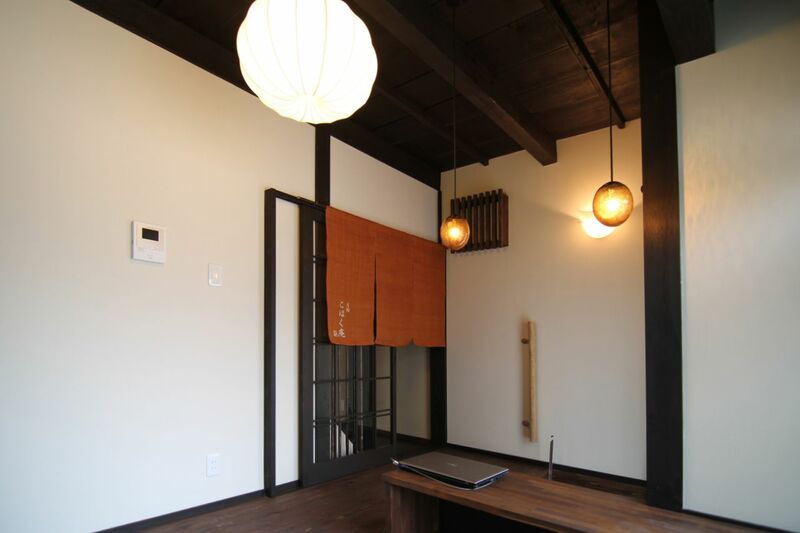 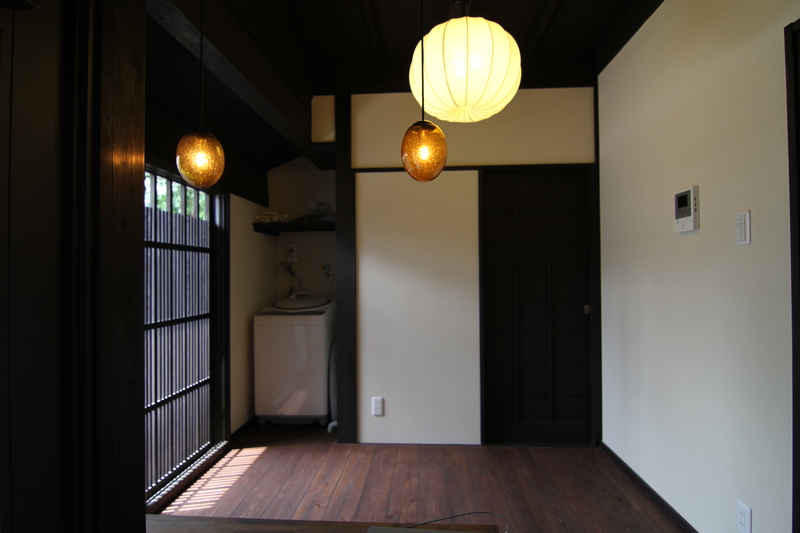 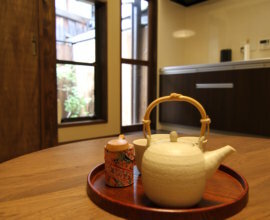 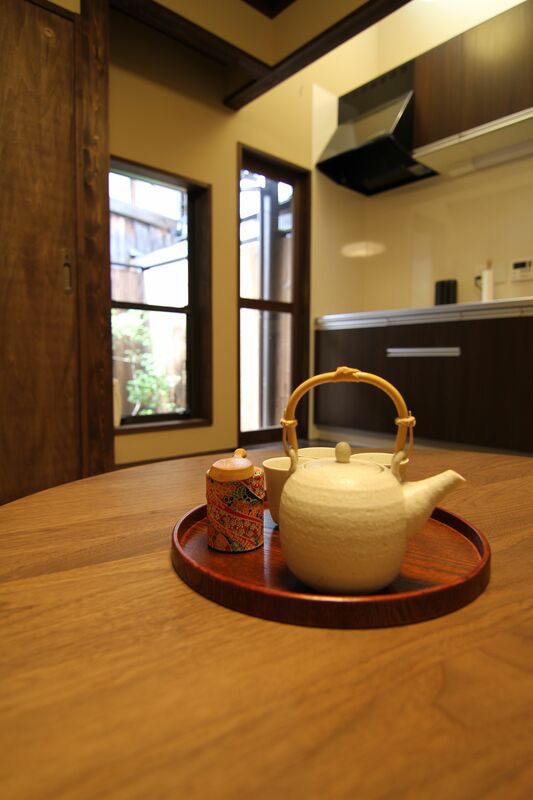 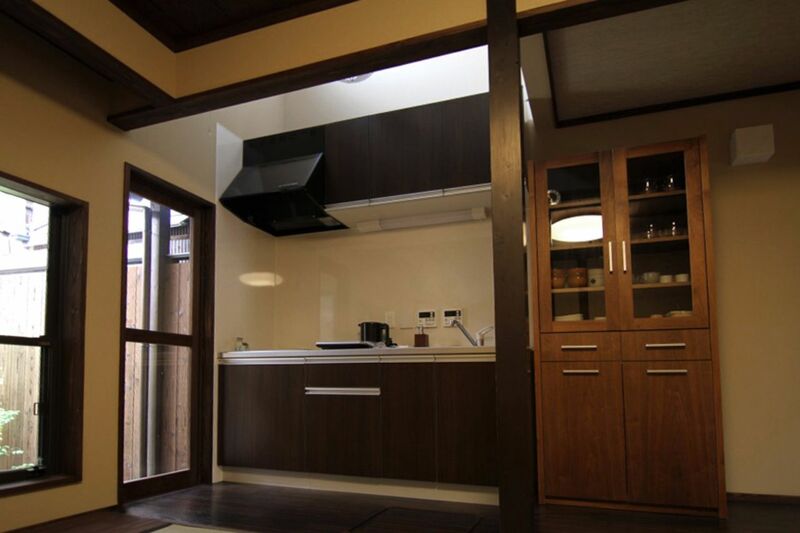 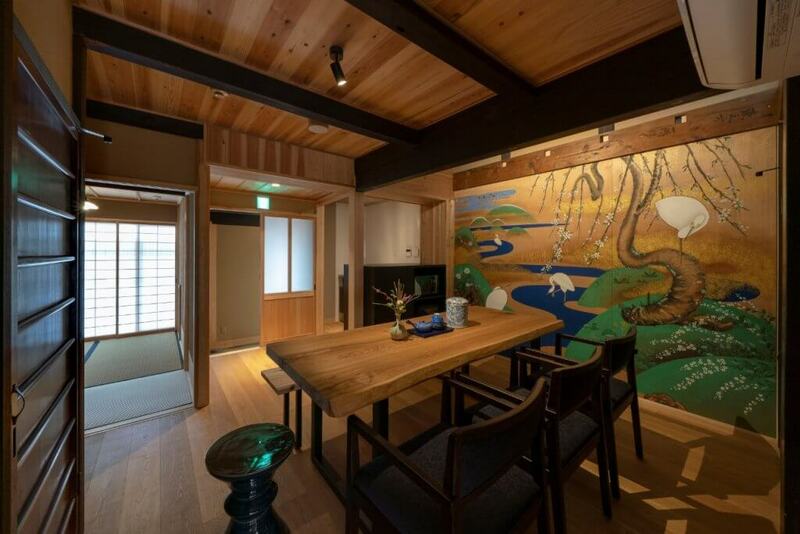 With an open floor plan on the first floor, you will also have the opportunity to appreciate the architecture & details of the traditional machiya house. 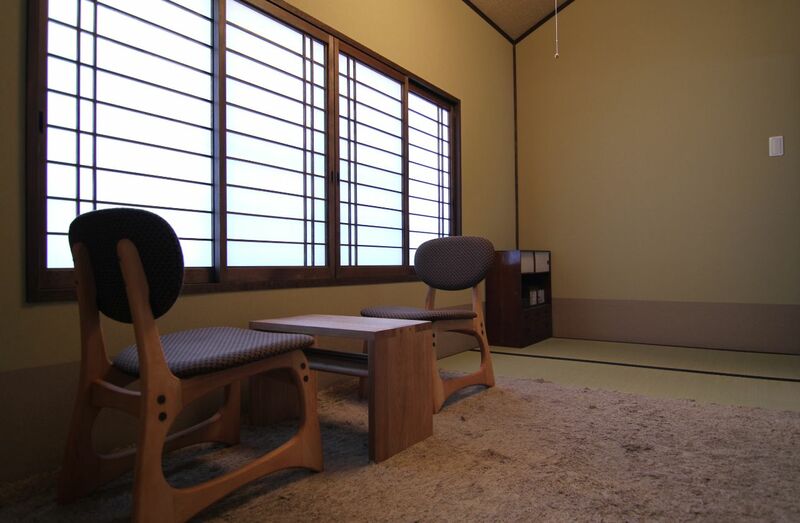 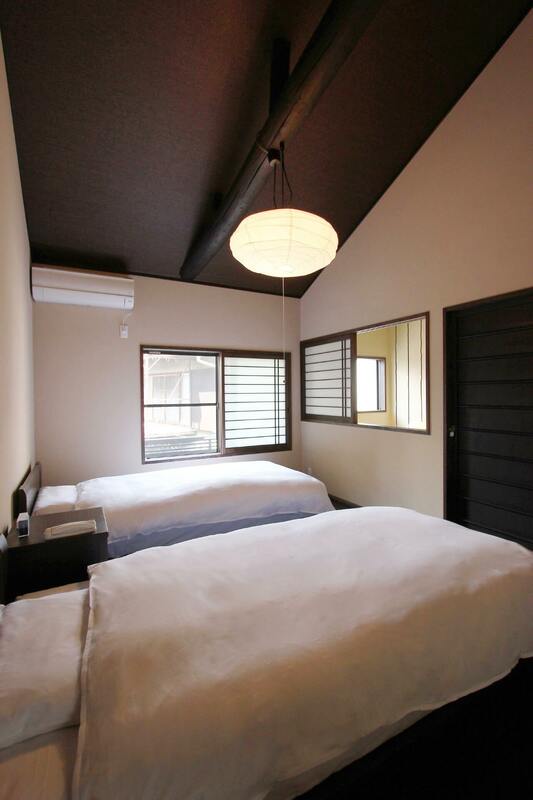 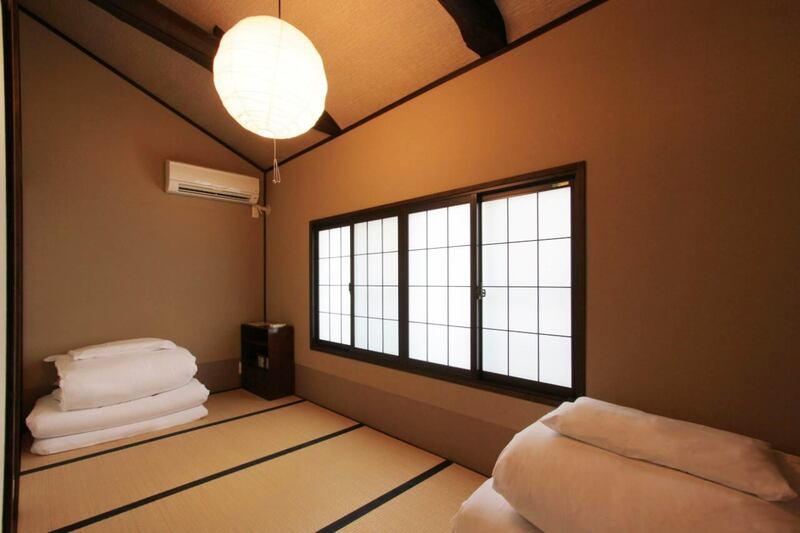 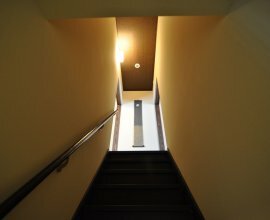 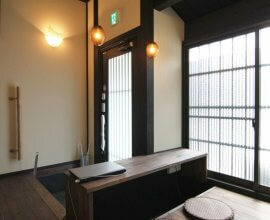 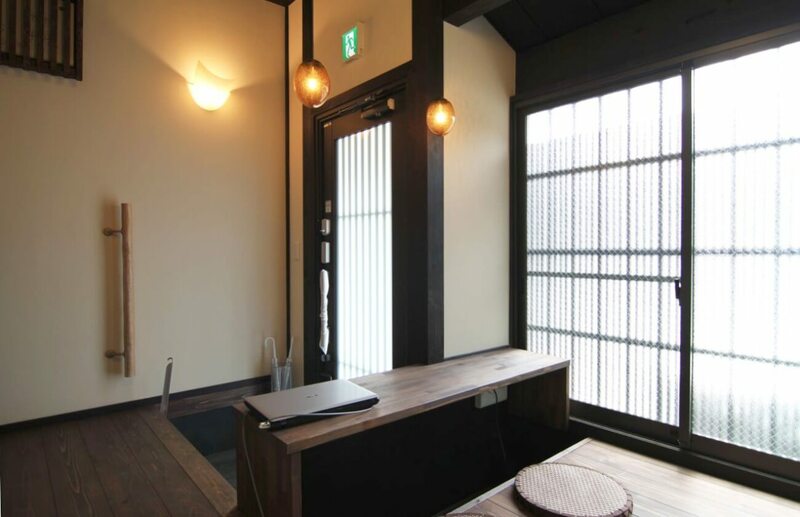 Warm atmosphere 'Kohaku' means amber, while 'An' means cozy retreat. 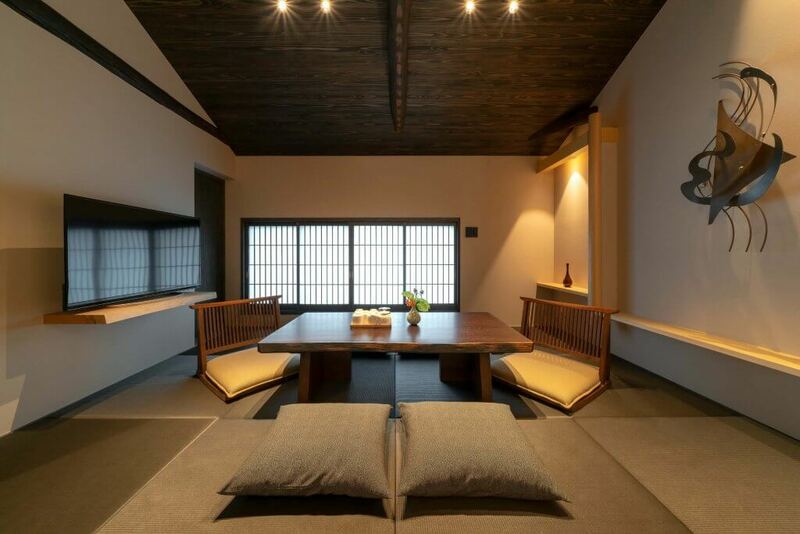 From the golden amber of the light fixtures to the dark wood beams, "Kohaku-an" is a warm and inviting retreat. 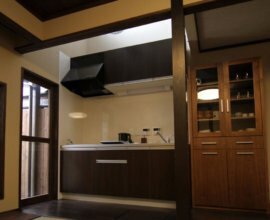 ’Hibukuro’ high ceiling A ’hikibukuro’ chimney that once ventilated the kitchen now opens up into the skylight of the 2nd floor. 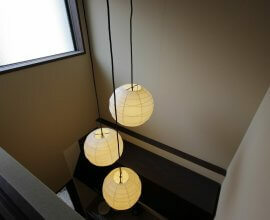 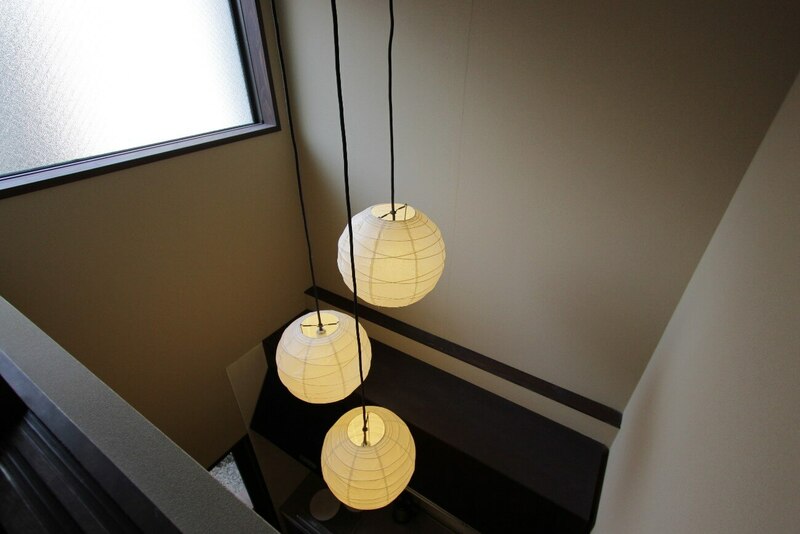 From the kitchen below, look up to see Japanese lanterns hanging above. 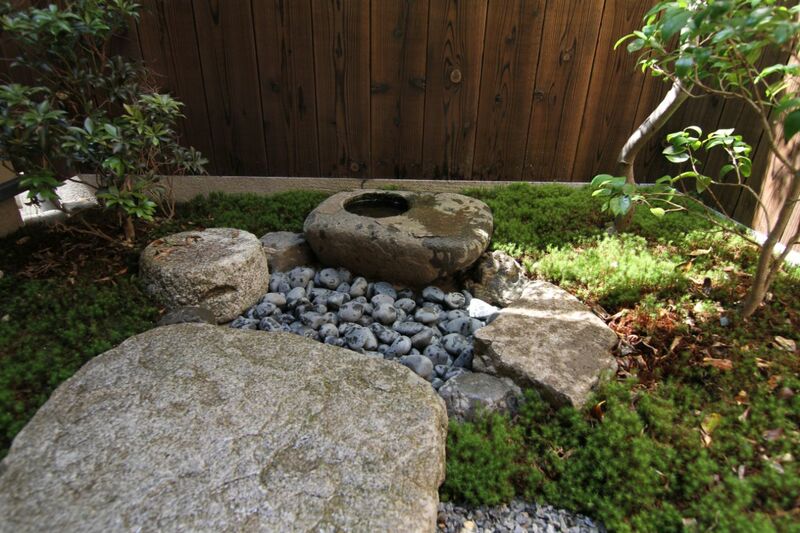 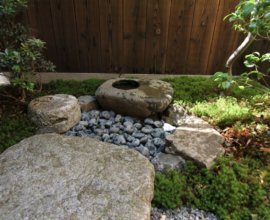 'Tsuboniwa' garden A private 'tsuboniwa' garden with a Japanese maple tree, small stepping stones and water basin invites light, nature and serenity into the home. 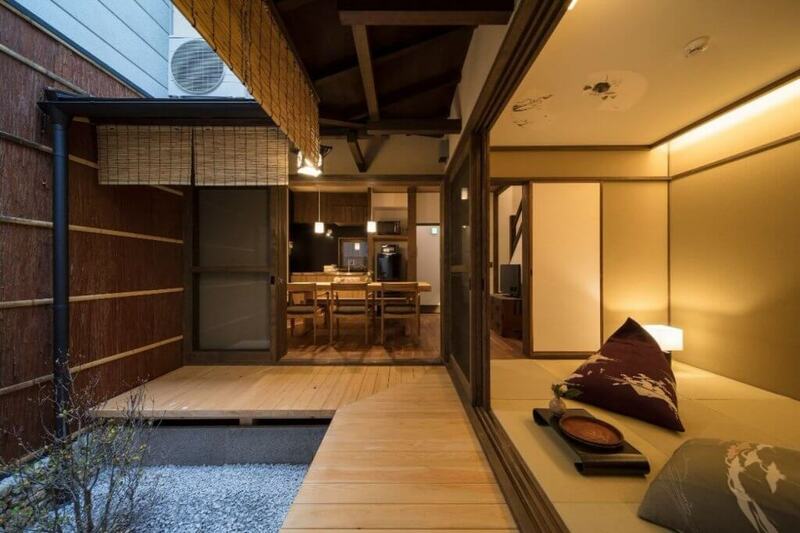 Open the door to step out into the fresh air. 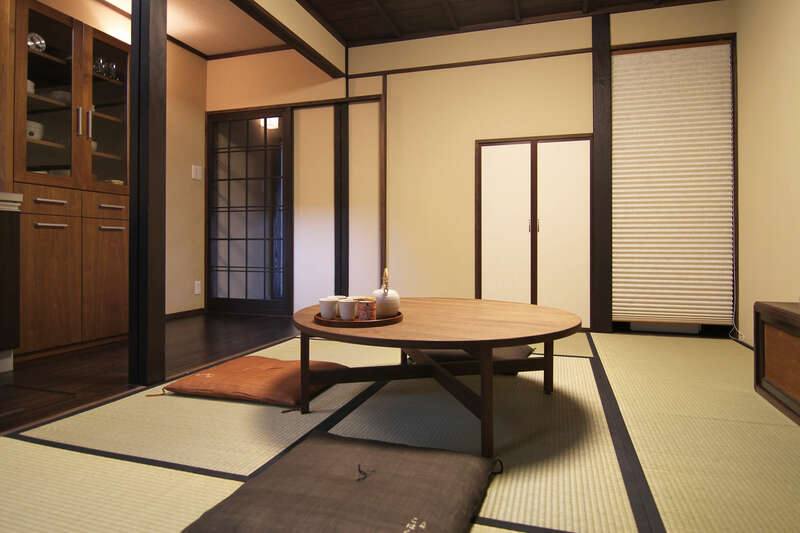 Living room The common area is the heart of the Japanese home. 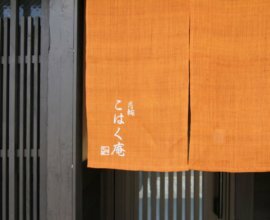 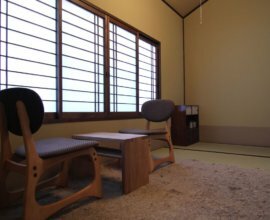 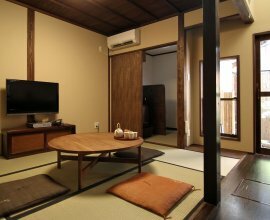 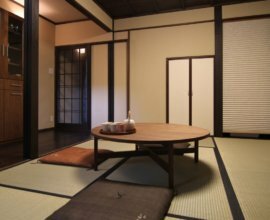 Experience traditional life and enjoy a meal in a room fitted with tatami flooring, low table with cushions and a view of the garden. 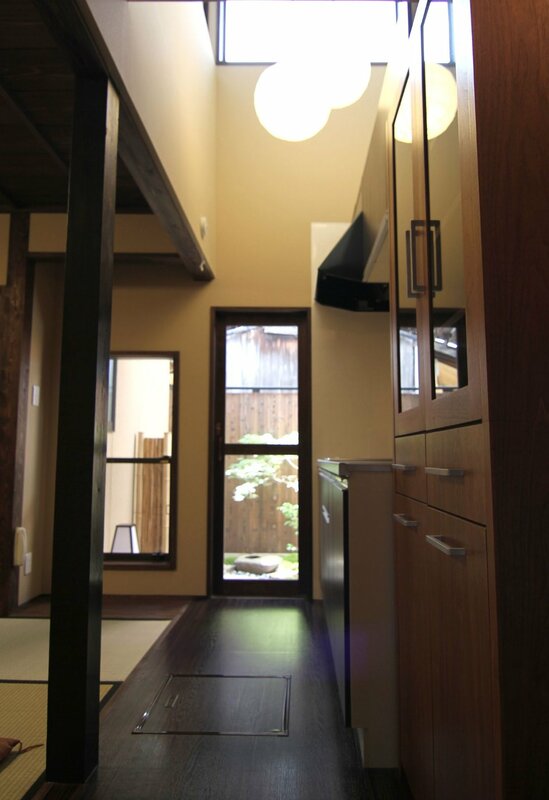 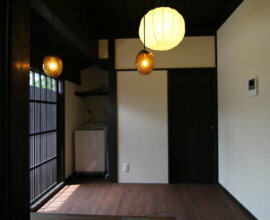 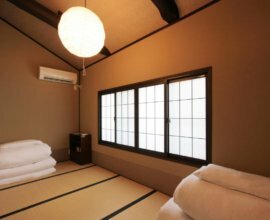 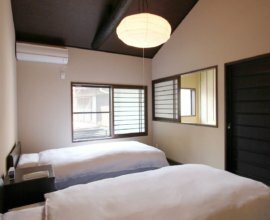 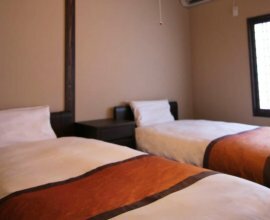 Two Bedrooms The golden hues of this machiya pair perfectly with the traditional dark wooden beams and large windows that bathe the bedrooms with warmth. 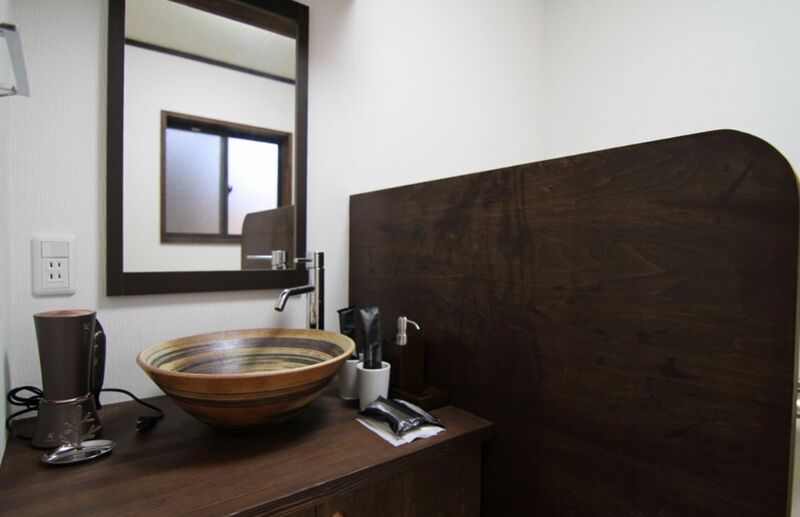 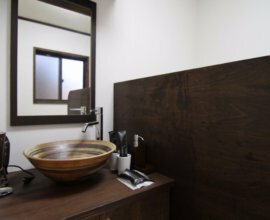 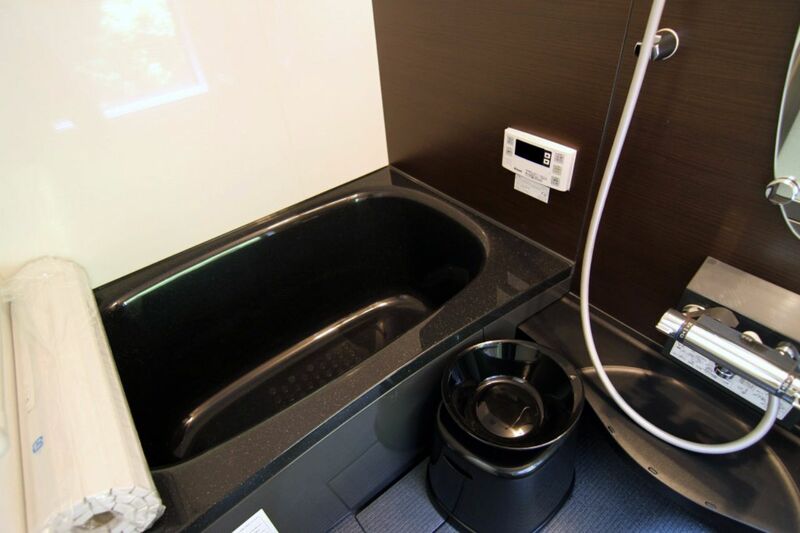 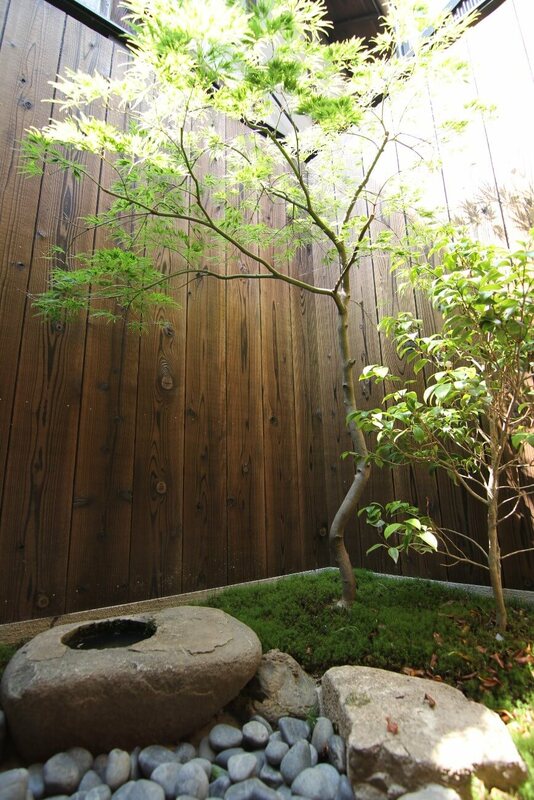 Bathroom Dark, wooden fixtures in the washroom and bath to complement the greenery of the “tsuboniwa” garden. 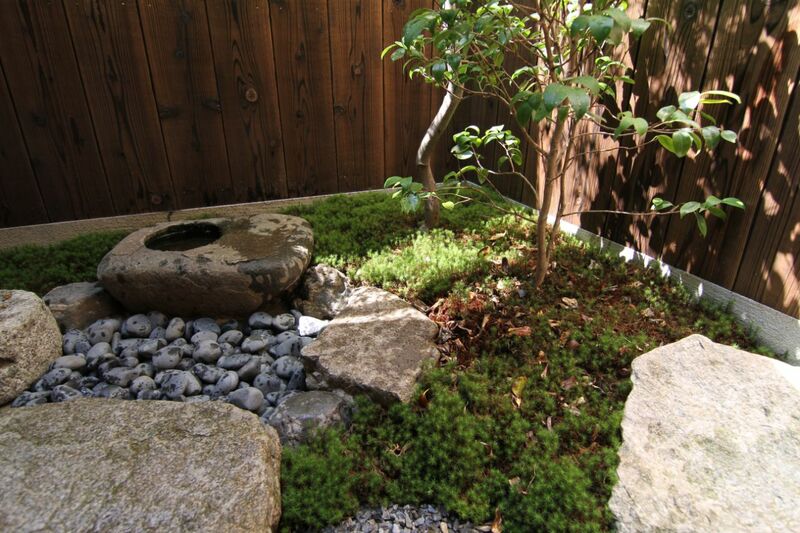 Soak in a relaxing bath, and look out towards the beauty of the garden. 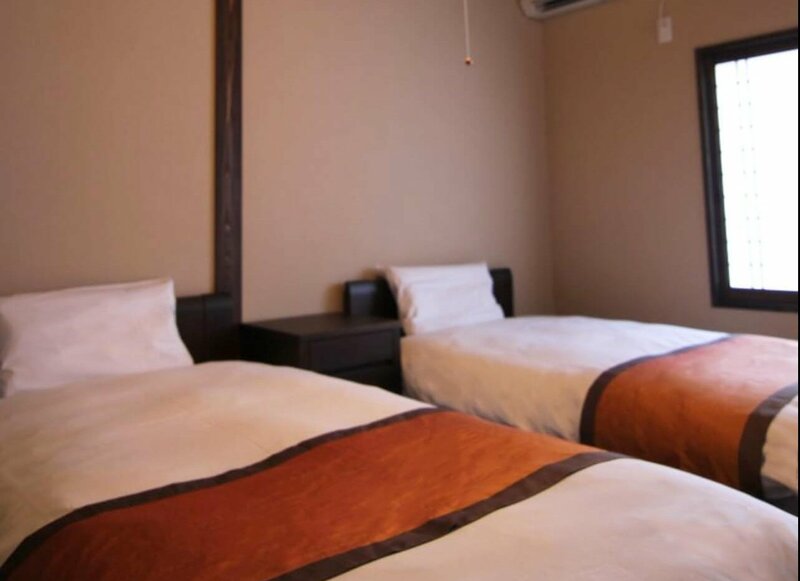 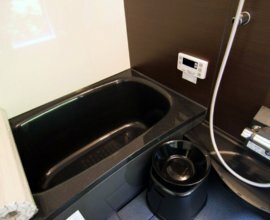 The excellent location of the Kohaku-an machiya gives you easy access to popular sightseeing spots such as Gion, Kiyomizu Temple, Sanjusangen-do, and Fushimi Inari Taisha, and is just one station away from Kyoto station. 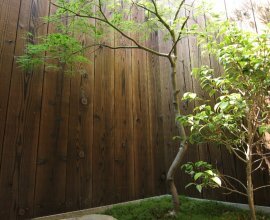 A 15-minute walk from your home is Tofuku-ji Temple, the perfect place for an early morning stroll, allowing you to appreciate this temple's beauty throughout the seasons, from plush green landscapes in the summertime, to brightly colored maple leaves in the autumn months. 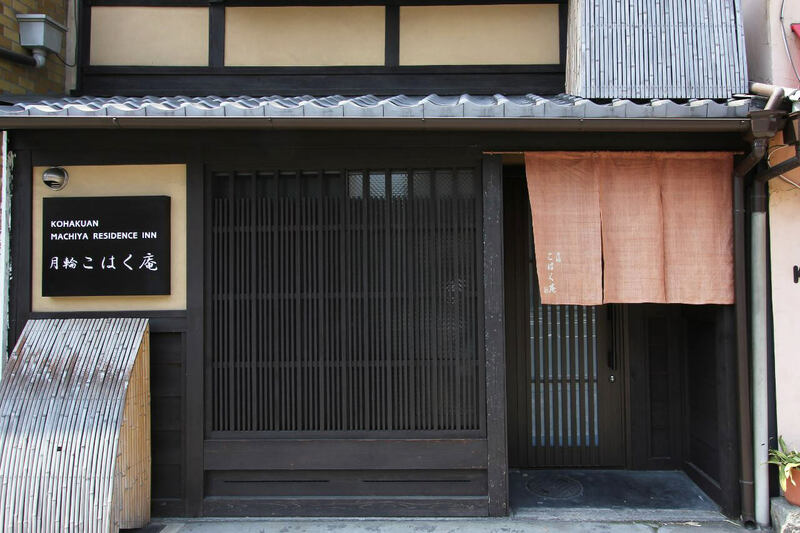 There are numerous bus stops surrounding the property-- take these buses north to visit the famous Silver Pavilion and wander along the "Philosopher's Path". 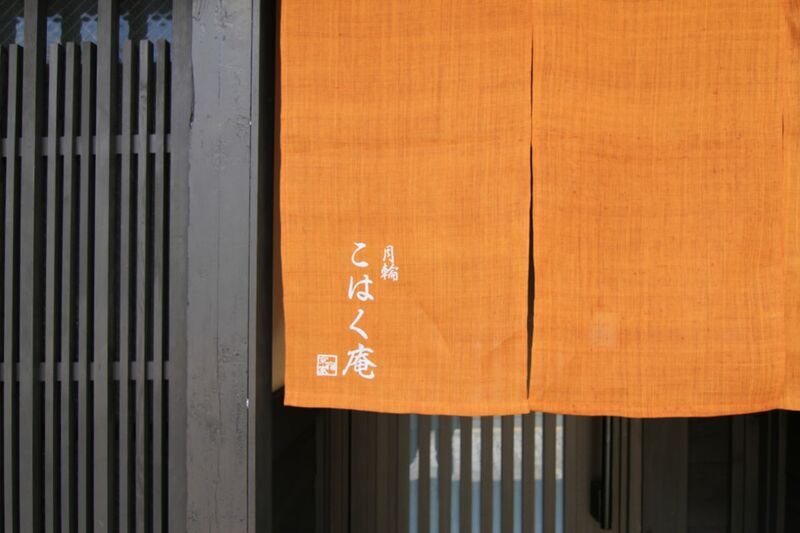 Take the JR Nara Line and visit Uji to experience Byodo-in Temple & its famous matcha green tea.